Okay – I admit it, I am petrified … of offending someone, of saying the wrong thing, of misreading a situation, of giving unqualified opinions, of compromising Sugarbytes’ integrity … of a million things. So, before I even start, I am going to address the elephant in the room: Land Reform in South Africa. An issue that affects every single one of us, integrally. I was born in Zimbabwe. When I was 9 years old, my family immigrated to South Africa as they saw no future under Mugabe’s rule. My uncle and boy cousin, third and fourth generation cattle farmers in the Nyamandlovu area, stayed on their farm until they were beaten and thrown in prison by the war veterans and police. When released, my cousin left for Australia and my uncle snuck back onto the farm to dip the cattle whenever he could. Today, there’s nothing left – no herd, no house, no point. We’ve lived through land reform and it wasn’t pretty. But we’re not the only ones: what about the people who were dispossessed before us? Were there any people dispossessed before us and if so, was it any less painful for them? Do two wrongs make a right? Should we be living by ‘an-eye-for-an-eye’ justice? Will we ever reach a place of harmony and fairness? I just don’t have the answers and now I find myself in front of a crowd who deserves just that: answers. After spending the morning with Jeremy Cole (the next Top Farmer you’ll meet), he led the way and introduced me to the management team at Kwambelu Sugar Cane. 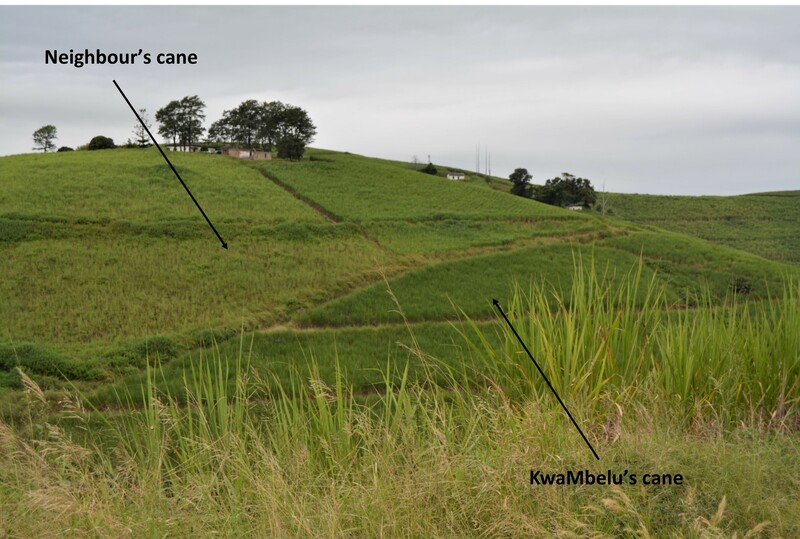 KwaMbelu Sugar Cane was awarded 3 adjacent sugar cane farms by the government in 2014. There are additional claims by this clan but they have been delayed due to the moratorium set on land claims when AgriSA appealed for public participation in 2016. A 24-month stay ensued and that ends in July this year, when the process will resume. The Mbelu clan is looking forward to growing from the 556 hectares they currently manage. 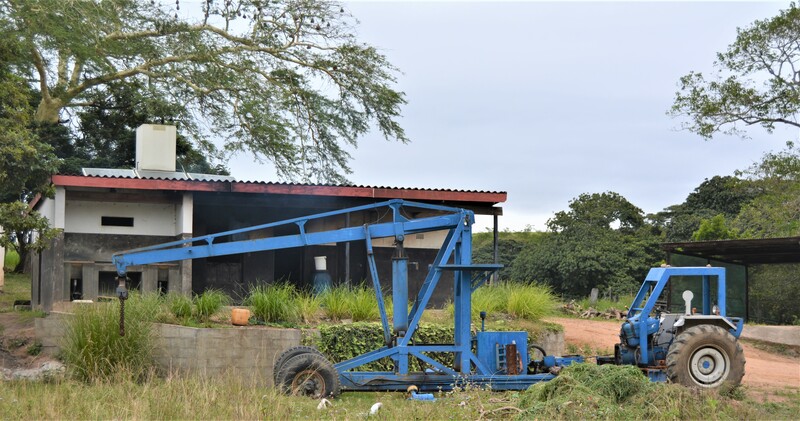 The two men responsible for the day to day farming operations are members of the Mbelu clan; Mlungisi Mjwara and Sunnyboy Mbelu. Sunnyboy tells me that his great grandfather grazed his cattle, grew meilies and called these hills home, way back in the late 1800’s. When Mr Payne arrived, he and his family were moved off the land and placed “on the other side of the river, below the cliffs” says Sunnyboy. Fast forward over 100 years and the 13 surviving descendants of the original Mr Mbelu, are now continuing his farming legacy. 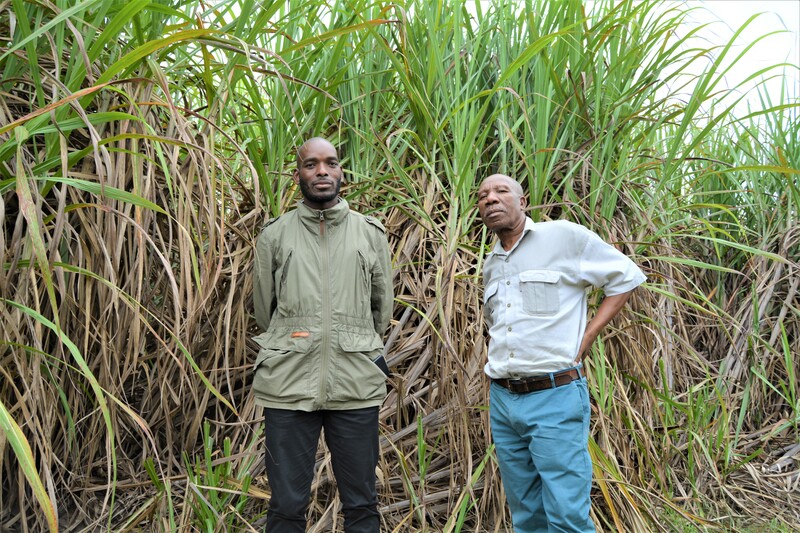 Sunnyboy was working in corporate, as a driver, and has now assumed his position as the eldest member of this clan, and he ably assists Mlungisi in growing KwaMbelu Sugar Cane into a great success story. Sunnyboy, looking across one of their farms. In the background, on the hill, are the homes of the community wherein the clan, who now owns the land, lives. Mlungisi Mjwara is Sunnyboy’s nephew and grew up in the area. After qualifying with a degree in Sport Management, he worked in the finance department at Toyota in Durban whilst waiting for the Land Claim to come through. Now he’s finally able to realise his dream of running a commercial farm. He moved into one of the three homes in October 2014 and embraced the challenge ahead. Mlungisi, his beautiful wife, Pearl and their two sons; Mlungisi Junior Mjwara and Mnotho Mjwara. Sunnyboy has chosen not to have either of his two wives live with him, preferring instead, the quiet calm of solitary living in his house on the KwaMbelu farm. I was fascinated to learn that, although Land Restitution might appear to be all roses for the claimants, it works far better in theory than it does in practice. When Mlunigisi and Sunnyboy took over in October 2014, they walked onto 3 farms that had been largely neglected for 4 years. “I can’t blame them,” says Mlungisi graciously, “I would have done the same thing. These people never knew when the sales would finally go through. They lived for four years being told that this month would be their last. 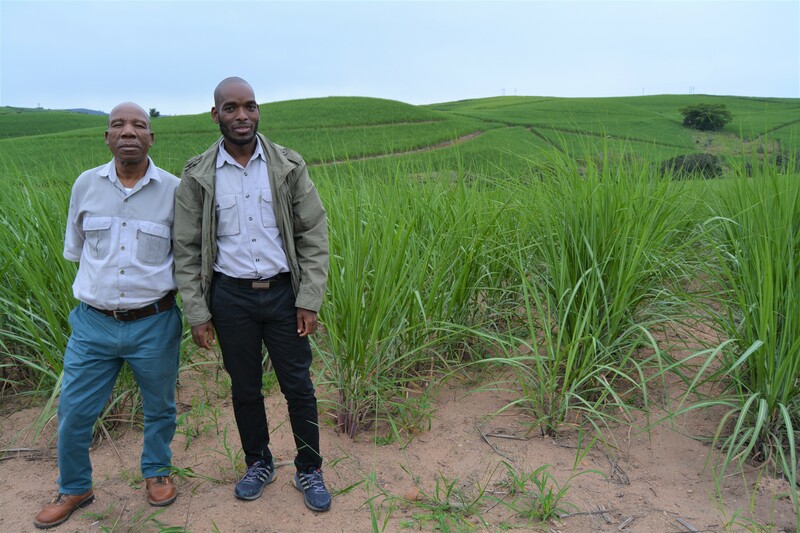 I also would have stopped fertilising and investing in the land.” The result is that most of the 436 hectares of sugarcane that has now become part of KwaMbelu’s operation was on the back foot when they took over. Compounding this challenge is the fact that the government purchases ONLY the land, without any of the necessary farming tools, so when the Mbelu’s arrived, there wasn’t a single piece of equipment, cup of fertiliser, or even one litre of diesel. Not even a match to light the first harvest fire. That hardly seems right and suddenly I had a better understanding as to why so many Land Reform operations fail. If I was to somehow become the proud owner of R25 million rands worth of sugarcane farm, without any support, advice, equipment or money, I am not sure I’d manage. So, it is with respect that I acknowledge exactly how well the Mbelus have done to, not only be establishing a viable operation, but to also be achieving the results they are: average yields of 85 tonnes per hectare with a purity of 11,5% are not to be sneezed at! Yes, sure – they have managed to muster up a lot of support from the industry, neighbours, finance houses and the Sezela mill and they are always very open to advice, but full credit is still due to the determination and hard work that Mlungisi and Sunnyboy have put in. While we were driving through the farm and talking about the progress and plans, I suddenly realised that 2014, the year the Mbelus began their farming careers, saw the onset of the recent drought. Whilst it wasn’t as severe here in the south as it was for our northern compatriots, it was still another obstacle for the fledgling enterprise that already had Everest to climb. The Mbelu’s only really have the farms surrounding them by which to gauge their progress and they were very proud to show me how they were doing here – illustrated with the pic above. 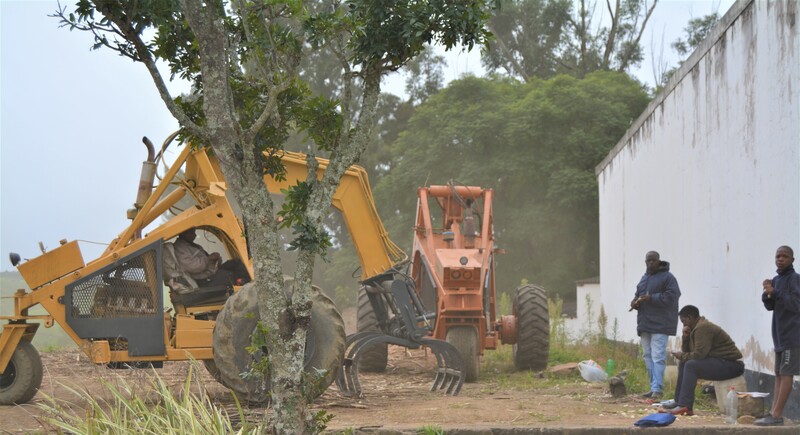 In this particular case, the neighbour does not have the excuse of facing a land claim … the Mbelu’s acknowledge that farming requires constant reinvestment, which they think might be the challenge next door. So, how have the Mbelu’s managed to push their production from 2000 tonnes in year 1 to 7500 tonnes last year (year 3)? Industry Support: Joe Nkala is the Extension Officer available in this area. His knowledge, advice and support have been invaluable as the team here continue to lean on him heavily especially when it comes to plant cane. “We are becoming more confident with the ratoon cane now,” smiles Mlungisi as he enjoys the growing independence. 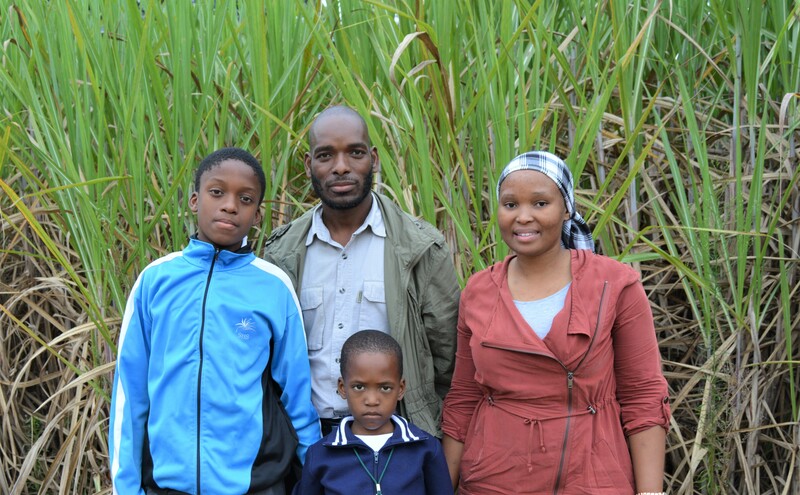 Both Mlungisi and Sunnyboy have also achieved the senior certificate in sugar cane farming presented by SASA. Mill support: Sezela mill have provided vital support that has proved instrumental in the success here: they have furnished complete maps and history for all the fields across all 3 farms and demonstrate their “mother ship” attention by even going as far as sending out heavy equipment to retrieve KwaMbelu’s tractors that were bogged down in wet fields last December, on the final day before mill shut-down. It is partnerships like these that weigh the scales in favour of a positive outcome for all. Commercial support: FNB continues to deliver the financial support this operation needs and has been responsible for them acquiring all the ‘tools’ they’ve needed thus far. Community support: The commercial farmers around the Mbelu’s have also contributed to their success by providing free seedcane, advice and support whenever called upon. Mlungisi admits that they are yet to turn a profit but next year will hopefully see them turn that corner. “Expenses are still far higher than income and everything that we’ve made so far has to be reinvested in the farm and it will probably continue like that for many years,” says Mlungisi wisely. 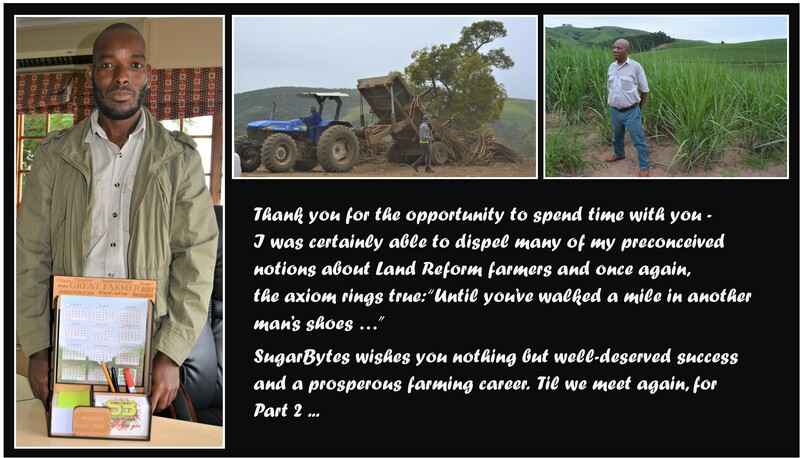 As this topic is the chief objective behind SugarBytes and therefore my purpose for being here, I was understandably nervous about how much we were going to ‘harvest’ from such new farmers. I dug through all the usual areas of fertiliser, herbicides, labour etc etc and must honestly state that I did not find anything riveting. And that’s understandable, given that the Mbelus are learning themselves and almost everything they do is under the advice of others. So, maybe that is a lesson in itself: be open and receptive to advice from all quarters! Given that forewarning, below I will go through the various areas discussed with the Mbelus and how they are currently handling the practical issues of farming sugarcane successfully. Plough out decisions: Mlungisi follows the 10% annual plough-out rule, as he was taught at SASA. He decides which fields will be replanted based on age and performance of the field. While a yield of 85 tonnes/hectare is deemed acceptable, anything below 65t/h gets ploughed out. 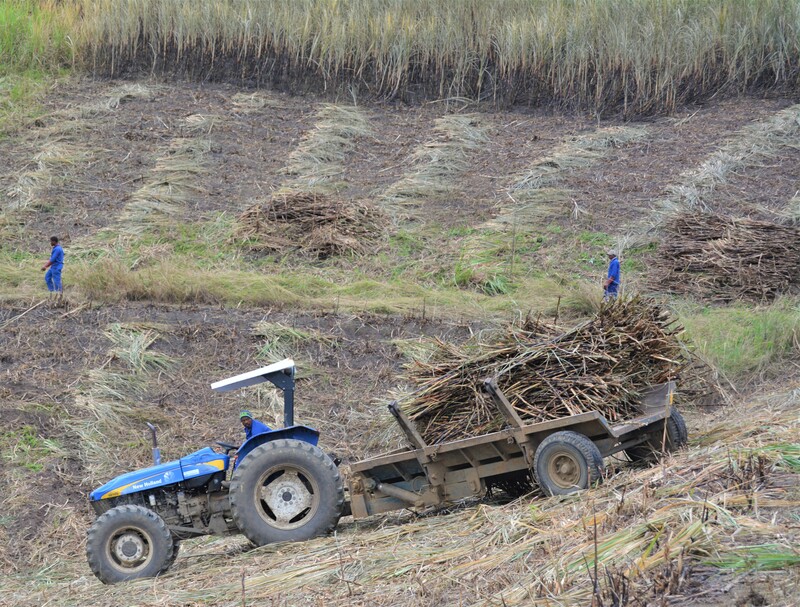 Harvesting: The field is harvested by hand and the cane is stacked in bundles. Side-loading trailers are used to take the cane to loading zones where the bundles are weighed by the crane and loaded into the contractor’s haulage trailers. The steep land makes it difficult to load the 4T loads required to achieve efficient haulage to the loading zone. I thought this driver did it well when he simultaneously pulled the bundle onto the trailer and turned the tractor to go downhill thereby avoiding the load shift starting a down hill roll. 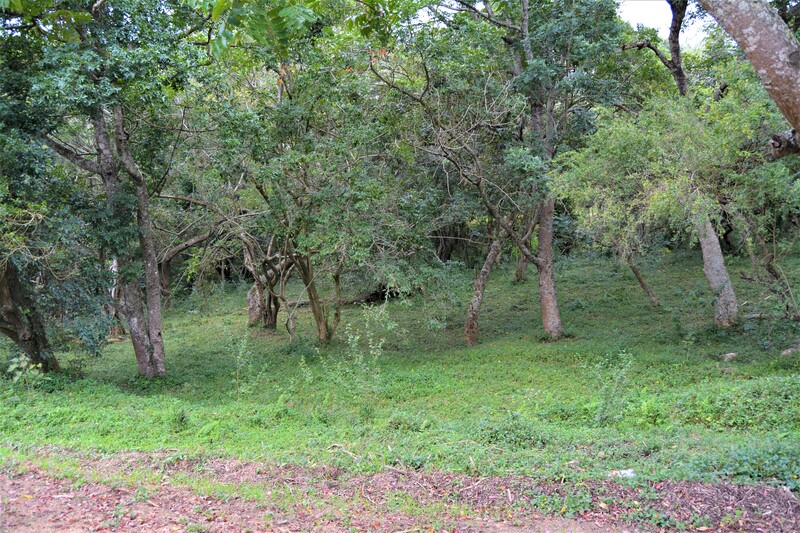 Fallow periods: If the field is to be replanted, the old crop is left to ratoon and is then sprayed with Round Up and left for 6 months so that the poison washes away. The community is then granted permission to plant beans in the field. This crop usually takes 6 months to grow and the leaves fall off when it’s time to harvest. This enriches the soil’s organic content. Depending on the time of the year, there may be a further fallow period before planting season which runs from September to January. Fertiliser: As no soil or fertiliser history came with the farms, soil sampling is done extensively and Joe Nkala’s advice is vital. Up until now, a basic 1:0:1 fertiliser has usually sufficed. This is applied onto the seedcane and the furrow closed immediately. Further applications are sometimes done before the cane canopies. Now that it’s been almost 4 years, the Mbelus are generating a nice history across all the fields and using specialised software programmes to keep track and build profiles. SASRI has been key in this support. 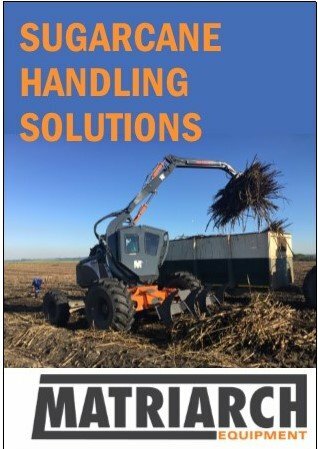 Herbicides: Before the cane germinates, they spray a pre-emergent herbicide as recommended Justin, their advisor from Farmers Agri-Care. 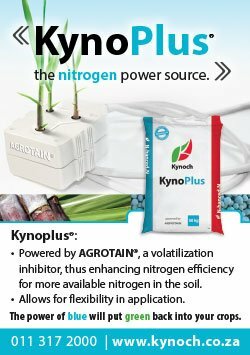 In fact, they are reliant on this company for most of their weed control advice and chemical supply. As you all know, weeds are a mine-field – different chemicals combat different species – even the most experienced farmers out there leave this expertise up to the specialists and the Mbelus are no different. Pesticides: So far so good in this department. Although they did have to harvest some Eldana-challenged fields in the early years, spraying has never been necessary. No other pests pose issues worth mentioning. Equipment: The Mbelus are proud of the equipment they now own: one John Deere tractor (the one they chose has proven to be too small for most jobs besides haulage and they hope to get bigger ones as finances allow), one Ford tractor (which one of the drivers rolled his first day on the job! It’s a 6610 and therefore a good size and they have been happy with its performance – bar the acrobatics. NB: no one was hurt in the incident ), one crane, two Bell loaders and two side loading trailers. Ripening: Is not practiced in this operation. A refractometer is used to establish the purity of the cane and, when at acceptable levels, harvesting commences. Labour issues: Somehow, I naively thought that a Land Reform farmer wouldn’t have any labour issues … but it seems that I am mistaken (again ). Apparently labour is highly sceptical of these farmers and they scattered when the farm changed ownership. All it took was for the Mbelus to demonstrate their dedication to the operation and soon the men and women started to trickle back. There were also a couple of arson incidents in the beginning; all part of the teething process. Nowadays, KwaMbelu experiences no more (and no less) hassles in this arena than the average commercial farmer. Natural areas / environmental concerns: I was incredibly happy to see hear that the Mbelus are eager to preserve the natural environment. Mlungisi explains that he was taught of this priority in school and will endeavour to practice conservation, particularly with the 110 hectares of natural bush on the farm. Timber: Currently the Mbelus also grow 10 hectares of timber that they supply to Sappi. Nguni Goats and cattle: Although the herds are still small, these are livestock avenues the Mbelus intend to expand. Mlungisi is very proud of “Smartiebox” his gorgeous bull. Agroponics: In February this year Mlungisi and Sunnyboy spent a week in Germany on an educational trip, sponsored by Government and organised by Farmers Weekly. The objective was to identify viable candidates for a hydroponics expansion into South Africa. The excursion gave them insight into smart farming tomatoes in green houses, where no soil is required. It was an amazing trip and, although Mlungisi is still nursing a cold from the journey, he is excited about this possibly becoming a part of the supplementary income for the KwaMbelu business, especially as establishment costs will be carried by the Germans. Watch this space! Mlungisi is an also an active member on the Central Committee for SAFDA and that led to an interesting conversation. Getting involved in this politics was not his intention. Mlungisi was completely focused on farming when he attended a SASA meeting wherein the notorious “walk-out” was discussed. He found the basis of this contention interesting and investigated further. This lead him to the founders of the SAFDA association and, before he knew it, he was part of the team. He has travelled the country and represented the body in government discussions and industry presentations. He is now passionate about their cause and about getting fair representation and support for black farmers who, he insists, face different challenges to those that white farmers encounter. There, that wasn’t so bad and if there was ever a story that begs a sequel, it’s this one! Who knows, maybe SugarBytes should start those at some stage; revisiting the success stories of 2017 & 2018 and reporting on the long-term outcomes? I’m not much of a fortune teller but I don’t think it’s too hard to predict the happy ending to this stormy start and I feel privileged to have been here in “Part One”.